The Moth is a character that acclaimed comic book artist Steve Rude created to appear in a trading card set, The Creator's Universe (1993). Rude's frequent inker, Gary Martin, encouraged him to create comics featuring the character, and eventually Martin wrote and Rude drew an eight-page story “The Moth,” which appeared in Dark Horse Presents #138. The comic book focuses on Jack Mahoney, an exceptionally-talented circus acrobat for the Vansant Family Circus. Part of his act involves dressing in costume as a character called “The Moth.” However, The Moth is also Jack as a costumed-vigilante, in which he uses his excellent wrestling and brawling skills; a gliding apparatus on his suit; and a gas gun to take down criminals. Jack catches these criminals in exchange for bounties. He uses money that he earns (or takes) from The Moth's crime-busting activities to do good and also to pay for the medical needs of his twin brother, Tad. The Moth seems like a blend of Batman and Marvel Comics' Daredevil with a bit of Spider-Man. Martin and Rude eventually planned to make The Moth a regular comic book feature. The character debuted in his own comic book, a one-shot entitled, The Moth – Special, written by Gary Martin; drawn by Steve Rude (pencils) and Martin (inks); colored by Glenn Whitmore; and lettered by Patrick Owsley. 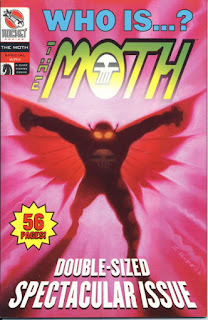 Published by Rocket Comics, a defunct imprint of Dark Horse Comics, The Moth – Special led to a four-issue miniseries, entitled The Moth. The Moth – Special (“Not of Flesh and Blood!”) opens with The Moth landing his latest bounty. Meanwhile, in Port Nolloth, South Africa, events are in motion that will bring something terrible to the United States. A few weeks later, the Vansant Family Circus is in full swing somewhere near the New Jersey Shore. Jack's boss, Victor, informs him that the local sheriff has asked for their help to capture an escaped lion, but Jack is in no mood to help the law. Soon, Jack will find himself forced to deal with something so horrible and so seemingly unstoppable that it will also require the help of mysterious powers all the way in Northern Botswana, Africa. I read The Moth – Special when it was first released 12 years ago. I am sure that I liked it, as Steve Rude is an artist whose work I have loved since I first discovered it. I just didn't remember a thing about this comic book. Having re-read it, I am saddened that The Moth did not catch on. 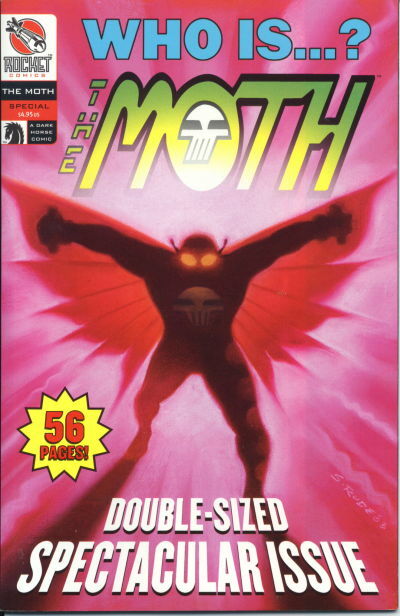 Rude had apparently planned on producing at least one miniseries featuring The Moth every year, yet the four-issue one the appeared after The Moth – Special was all that appeared (as of this writing). In The Moth – Special, Rude is in top form. This comic book is filled with all the elements that mark the work of Steve Rude: inventive page layouts, his sterling composition, the attention to set design in just about every panel, his impeccable draftsmanship, and his stellar figure drawing. Rude is one of the most talented artists ever to draw a comic book. Over the past four decades, he has consistently been one of the best comic book artists in North America. No one drawing for DC Comics or Marvel right now even approaches his ability, and that includes Jim Lee. Steve Rude's love of the comics medium is so evident in The Moth – Special, and that love is evident to the reader. Writer Gary Martin (who also inks Rude's pencils) offers a story that is part rip-roaring crime, part monster comics, and part lurid horror tale. The monster in this comic book is genuinely scary, and until the matter is resolved, the battle between good and evil seems like a forgone conclusion – with evil winning and everyone else becoming a meal. Someday, there will be comic book justice, and The Moth will be back. Until then, The Moth – Special and the miniseries that followed it are lovely comic books with timeless appeal.